Honey bees have been an integral component of agriculture because they are used to pollinate numerous fruit and vegetable crops. In North Carolina alone, honey bees account for over $150 million per year in added crop yields. The apiculture industry, however, is not without its challenges. Perhaps the greatest challenge has been the introduction and spread of exotic honey bee parasites, which have decimated the wild population and caused a dramatic drop in the number of managed beehives in the state. A second crisis looms with the potential spread of Africanized honey bees (AHB) from states further south, the results of which are difficult to predict. This note attempts to provide a brief history of the AHB in North America, its current distribution, and the likelihood that it will become established in North Carolina. The history of the Africanized honey bee has been well documented (Winston, 1992; Rinderer et al., 1993; Schnieder et al., 2004). Several mated queens were imported to Brazil from Africa in 1956 to breed a honey bee that was well-suited to a tropical climate. At that time, Brazilian honey production was very low because the European honey bee (EHB) is better adapted to a more temperate environment. The goal was to produce hybrids that exhibited the foraging success of African bees while maintaining the gentleness of European bees. The inadvertent escape of the African queens established a feral population of “Africanized” hybrids that, unfortunately, retained most of the unfavorable traits of their African ancestors. The AHB spread at a remarkable rate (Figure 1), upwards of hundreds of miles per year. As the population grew, it expanded its range outward from São Paulo south into Argentina and north through Central America and Mexico. In its wake, the AHB severely hampered the apicultural industries of Brazil, Venezuela, and Panama, and forever changed beekeeping practices in Latin America. Moreover, the AHB gained its “killer bee” moniker because of its increased defensive behavior, and became known as a serious public health issue in the Americas. Although stinging incidents of humans, livestock, and domestic animals have increased in Africanized areas, the annual human mortality due to bee stings remains lower than lightning strikes. Stinging incidents aside, the major significance of the AHB in the United States will be within the apicultural industry. Professional beekeeping in the United States maintains strong ties to the southern third of the country due to its mild winters and longer foraging seasons. Migratory beekeepers annually overwinter their colonies in the southern states, then pollinate various crops as they move northward as the seasons change. Queen and package production is also concentrated in California and the southern states to supply the rest of the country with commercial stock in the early spring. These industries will be impacted severely by the AHB if tight restrictions are placed on the movement and shipment of honey bees. Figure 1. 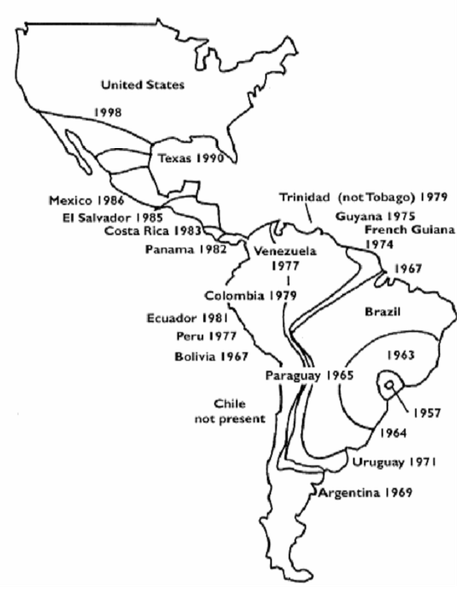 The spread of the AHB in the Americas from 1956 to 1998. The Africanized honey bee was first detected in the United States in 1990 in south Texas (Figure 2). For three years, their distribution was confined to the southern part of that state. In 1993, however, the AHB was detected in Arizona, and by 1995, they were detected in New Mexico and southern California. The bees then spread north, and by 1998 they were found in Nevada. In every state where they became established, the bees continued their migration northward over the next few years. By 2004, the bees had migrated through Texas and were detected in the southern most counties of Oklahoma. For reasons that are yet unclear, the eastward spread of the AHB stalled in Texas for many years. This unexpected hiatus in home-range expansion was hypothesized to be a result of climate or other ecological factors. Nonetheless, by 2005 the AHB expanded eastward from Houston. Most recently, the AHB has become established in western Louisiana, southwestern Arkansas, and southern Florida (Figure 2). It remains unclear how the AHB entered Florida, given the lack of positive AHB findings along the gulf coast, thus it seems likely that the bees were independently introduced on cargo ships through commercial shipping ports. Figure 2. 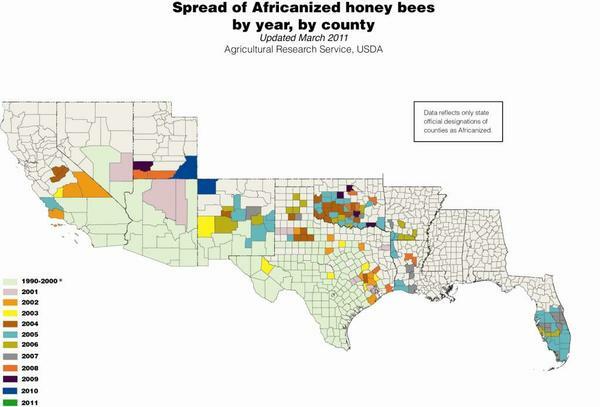 The current distribution of Africanized honey bees in the United States. Will the AHB Ever Become Established in North Carolina? There are two ways that the AHB may spread into a new area. First, they may migrate through the natural processes of swarming (reproduction through colony fission) and absconding (the complete abandonment of a hive). Second, they may spread inadvertently by human-assisted transport, either by the movement of managed beehives (such as migratory beekeeping) or the shipping of cargo from Africanized areas (such as the desert southwest or South and Central America). Given the annual north-south traffic of migratory beekeepers from Florida to Maine, it is probably that the AHB will be introduced along the entire eastern seaboard. In fact, there have been two verified reports of the introduction of AHB to North Carolina. Swarms of Africanized honey bees have been found and destroyed at the North Carolina ports of Morehead City (1989) and Wilmington (1991). Those swarms of AHBs were “stowaways” on ships that entered those ports from Africanized areas (presumably South America). The bees were detected and destroyed by the joint efforts of the North Carolina Department of Agriculture and Consumer Services (NCDA&CS) and the customs agents working for the United States Department of Agriculture (USDA). The USDA, through its Animal and Plant Health Inspection Service (APHIS), has a standing policy to monitor the movement of the Africanized bees into US ports and to destroy them upon positive detection. In North Carolina, the NCDA&CS and NC State University have worked with the APHIS inspectors at the ports of Wilmington and Morehead City so that they are prepared to deal with the arrival of bees at those ports. In addition, both of those port areas have been declared “bee-free” zones, and trap nests have been established to attract any bee swarms at the ports. Such bees will be destroyed and then examined to determine if they are Africanized. It is not a question of whether the AHB will be introduced to North Carolina—as they have in the past, and they almost certainly will at some point in the coming years—but a question of whether or not they will become permanently established in the state. While it is difficult to make any firm predictions of the final distribution of the AHB in North Carolina, it is critical that all residents of the state become aware of this possibility before they arrive and if they become established. Caron, D. M. (1999.) Honey Bee Biology and Beekeeping. Cheshire: Wicwas Press. 355 pp. Rinderer, T. E., B. P. Oldroyd and W. S. Sheppard. (1993). Africanized bees in the U.S. Scientific American 269: 84-90. Schneider, S. S., G. DeGrandi-Hoffman, and D. R. Smith. (2004). The African honey bee: factors contributing to a successful biological invasion. Annual Review of Entomology, 49: 351-376. Winston, M. L. (1992). Killer Bees: The Africanized Honey Bee in the Americas. Cambridge, Harvard University Press.